Ciaran Tourish hails from Buncrana in East Co. Donegal. Although Ciaran started playing the tin whistle at an early age, he soon took up the fiddle under the guidance of local legendary fiddler and teacher, Dinny McLaughlin. 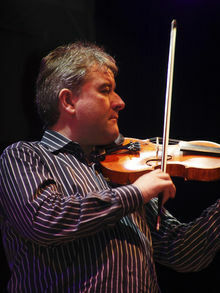 In addition to his mastery of the dance music tradition, Ciaran’s quick ear, love of harmony and counterpoint have led to his talent being in demand as a valued collaborator on non-Altan and even non-Irish music projects with a wide range of musicians and singers including Paul Brady, Matt Molloy, Mary Black, Maura O’Connell, Máirtín O’Connor, Dolores Keane, Dé Danann and American musicians, Jerry Douglas and Tim O’Brien. He released his first solo recording “Down the Line” in 2005 featuring guest musicians Arty McGlynn, Paul Brady, Maura O’Connell, Tim O’Brien, Alison Krauss and Jerry Douglas among others.